Linda McKechnie is well known for her significant contribution to the art of handbell ringing. She served the American Guild of English Handbell Ringers as the fourteenth President from 1987-1989. The music of Linda McKechnie has reached thousands of people through her 50 handbell titles and over 80 piano published arrangements with organ, solo instruments, and orchestra. Linda’s Published handbell music covers a wide spectrum, from Music for the First Time (a method book for beginning ringers) to arrangements ranging from easy to difficult levels for 3-6 octave handbells. Many incorporate other instruments such as brass quintet, timpani, keyboard, treble solo instruments, and most recently full orchestra accompaniment. Recently, she was commissioned to write for handbells and big band! As a volunteer, Linda has a compassionate heart to make a difference in the lives of the functionally disabled, underprivileged, and the elderly. Realizing that her music is therapeutic and heals the spirit, Linda has been involved in the Junior League Singers, performing at assisted living and community centers. Presently, Linda is involved in helping Brookwood, a community for functionally disabled adults, to form a handbell/handchime program, to teach them music skills and build their confidence to perform in the Houston area. Linda and her husband, David, have initiated the D. Linda McKechnie Handbell Musicians of America Scholarship to help fund opportunities for educators in the field of the Special Needs Community and elementary education with handchimes and handbells. Linda’s arrangements for handbells and orchestra have been performed by major symphonies to include the Detroit Symphony, Orlando Symphony, and Charlotte Symphony. During Christmas 2003, the Boston Pops and the Ring of Fire handbell group performed Linda’s arrangement, We Three Kings with Farandole from L’Arlesienne. As a Steinway Artist and prolific publisher and arranger of handbell and keyboard music, she continues to be a recipient of the ASCAP special awards. Linda was named “2002 Composer of the Year” by Jeffers Handbell Supply. 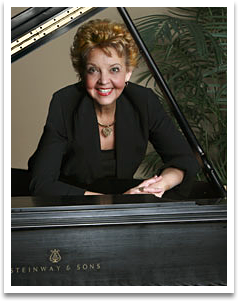 Linda maintains a heavy schedule throughout the world as a concert pianist and recording artist. Her recordings, with signature style of blending classical themes with Christian music, remain very popular in the Christian instrumental division: Hymnworks I and II, Hymnworks Christmas, Symphony of Praise I and II, A World of Praise, Rhapsody of Love, Rhapsody of Christmas I and II, Reflections and Worship Collage. Moments With the Savior, recorded with the London Festival Orchestra, recieved a 2000 Dove Nomination. Through her published and recorded music, Linda endeavors to bring joy to people’s lives in a refreshing and new way. -Please note: with some titles, the handbell music must be ordered directly from the publisher. However, with other titles, handbell music is included in the cost of the arrangement, with permission to make multiple copies. -Included in the orchestration is a conductor’s score and one copy of individual parts. Permission is given to make multiple copies of individual parts. -Arrangements are recorded on Hymnworks Christmas and Rhapsody of Christmas II and may be purchased under "CDs"
performed with 3-5 octave handbells and full orchestra. Handbell music is included with Conductors score and individual parts. 2:14 He Is Born with Dance of the Reed Flutes from Nutcracker Suite by Tchaikovsky This NEW arrangement from Rhapsody of Christmas II may be performed with 3-5 octave handbells and full orchestra. Handbell music is included with Conductors score and individual parts. Please note: there are no trumpet, trombone, french horn, and tuba parts written. This NEW arrangement from Rhapsody of Christmas II may be performed with 3-5 octave handbells and full orchestra. Handbell music is included with Conductors score and individual parts. Please note: The basic format of the following arrangements uses bells with keyboard accompaniment. If there is an instrumental part, which is separately noted from brass parts, the instrument(s) may be added to the bells and keyboard. However, the brass choir is a substitution for the keyboard part and is not designed to be played with the keyboard. Brass choir combination: 2 trumpets, 1 horn,1 trombone, 1 tuba. This NEW arrangement from Rhapsody of Christmas II may be performed with handbells (3-5 octaves) and keyboard. This arrangement includes handbell music with keyboard accompaniment. This NEW arrangement from Rhapsody of Christmas II may be performed with handbells (3-5 octaves), keyboard and optional treble instrument (flute/violin). This arrangement includes handbell music and treble instrument. Here We Come A-Caroling with Rondo by Bull This NEW arrangement from Rhapsody of Christmas II may be performed with handbells (3-5 octaves) and keyboard.